A Familiar Fin made its latest appearance this weekend at the Maritime Aquarium’s Ocean Litera”sea” event! Asked to speak as a featured local author, I shared my book with aquarium-goers, young and old. Now, I had been to South Norwalk’s aquarium before, but only as an observer. 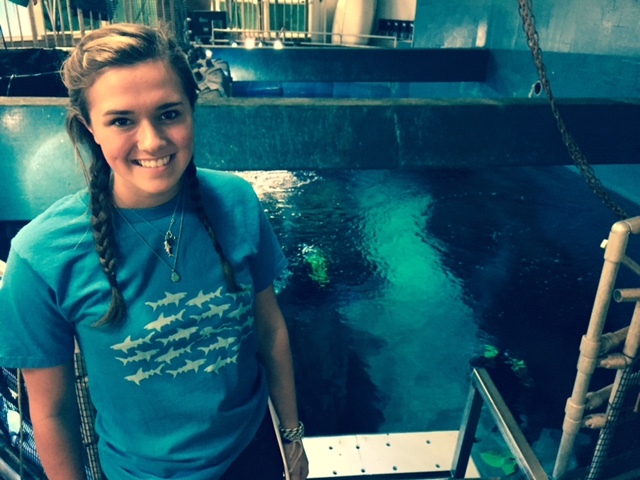 Saturday, I had the privilege of going behind the scenes of the shark exhibit. Sandtigers and other species cruised around the cage with ease, slipping by the enormous glass windows. Standing above the shark tank (pictured below), I listened to the volunteer divers inside the tank participate in a Question and Answer session with curious onlookers. Thanks to new technology, the lead diver in the tank can hear questions posed by inquiring ocean-lovers, and respond in real time. One of my favorite questions posed on Saturday was the classic, “are you scared?” Chuckling a little, the diver responded with an emphatic no—maintaining that she dives with these sharks every day and finds them to be quite calm and docile even in her presence. Amazingly, the divers told me that the sharks are even thought to be able to identify each diver. Newer divers the sharks tend to stay away from, while more frequent divers receive a warmer reception—likely a result of sharks’ electroreception, or ability to detect unique electrical impulses from living beings. After witnessing, first-hand, the incredible work the Maritime Aquarium does to dispel negative myths about sharks (I mean, they quite literally prove to their audience that sharks aren’t man-eaters), I came home inspired and full of hope for the future of our oceans! So we’ve talked about the big…the epic, the apex, the jaw-some carnivores that rule the ocean. But what about the little guys? And better yet, what about the middle guys? We call these forage fish. Forage fish are the glue that bind many ocean ecosystems together, acting as main food sources for higher tropic level predators. Larger fish, marine mammals, and seabirds can all depend on forage fish to survive. A few years ago, Ellen Pikitch, Konstantine Rountos and scientists set out to understand the ecological importance of forage fish to marine ecosystems and the economic importance of forage fish to marine fisheries. In their results, they found that these “middle” guys contribute a total of $16.9 billion USD to global fisheries every year—directly, being caught and sold, and indirectly, by sustaining larger life that is caught and sold. But what makes a fish a so-called ‘forage’ fish? You eat, you get eaten….it’s life—so what’s so special about forage fish? This is the question that Dr. Konstantine Rountos is answering. “There’s no distinct, clear definition” for forage fish, says Rountos. This summer, Rountos analyzed the definition of forage fish from many different angles. Rountos, an undergraduate student, and a high school student (yes, this is where I come in!) drew definitions from several key forage fish papers and, using fish base, looked at the particular specs for each fish. Thousands of forage fish entries later, Rountos will now be looking at commonalities and averages of this data to pull together a better definition for forage fish. Check out these sources for extra information! Shark Week Special: Will Discovery Disappoint? As people enjoy their sunny summer getaways by day, they tune into the dark depths of Discovery Channel’s Shark Week by night. Families sit gathered around the TV, glued to the horrifying madness before them. 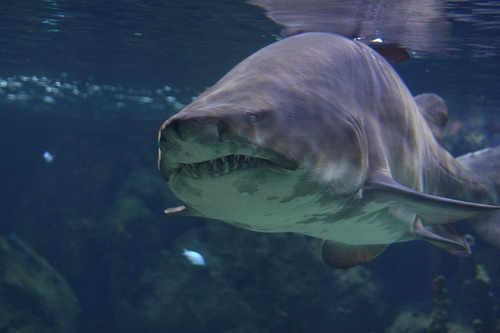 Shark attack survivors recount vicious tales of hungry creatures that lurked below them. Documentaries detail the violent lives of still-existing Megalodons and thirty-foot Great Whites. Year after year, we are again sucked into the thrilling madness that is shark week. However, a problem arises when fact and fiction are mixed together, seamlessly tied into one video segment. How would—how could the average person know when to stop believing what these “scientific” documentaries tell them? For the past few years, Shark Week’s quest to boost ratings has ignited shark conservationists across the world. In a recent NPR segment, it was said that “many scientists think the huge audiences — and the hype — have come at the expense of real science.” The factual errors, over-dramatization and vilifying of sharks have made sharks enemies rather than glorified celebrities. This year, though, Shark Week producers have promised to take a turn for the better. 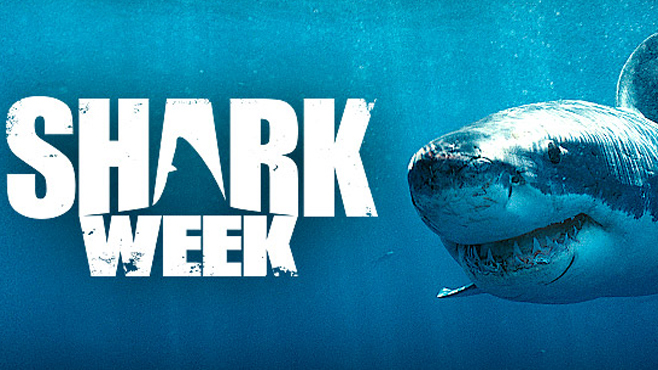 Discovery insists that Shark Week 2015 will focus on real research and science, promoting shark conservation. So far, the segments look promising. More than ever before, sharks need Discovery on their side this year. Tune in to see for yourself–and comment to let us know what you think! Want to celebrate these beautiful creatures during one of the best weeks of the year? Buy my new children’s book, A Familiar Fin, on Amazon today. All the profits go to Sharks4Kids! 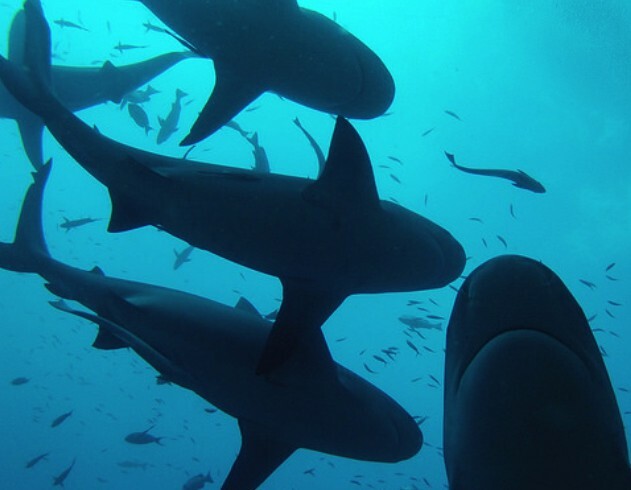 Socially Involved Sharks: Using Finstagram? When we say that sharks are quite proficient social learners–what does that mean, exactly? Do they learn like we do in the human world? Are they active finstagrammers? In the human world, we learn from our own experiences, but we also learn socially from our interactions with others–and we are not alone. Many scientists are beginning to believe that sharks are not only capable of this complex behavior, but can also harness this method of learning to produce incredible results. During my month spent on the Shark Reef Marine Reserve of Fiji last summer, I was able to conduct a simple research investigation to further explore this question. Every day, our group of high school students dove down to 100 feet to witness the feeding of bull sharks by trained Fijian dive masters. Bull sharks lined up to the left of the feeding station and, once fed, swam away to the right. If any shark hoping to be fed entered the feeding station from the wrong side, the dive masters would tap the shark on the nose with a short pole. Compiling the data from these magnificent dives, we analyzed the number of sharks prodded over the time interval and found that it significantly decreased over time and attributed this decrease to the bull sharks’ social learning capabilities. A micro-project to represent a much bigger phenomenon!